The Ashvakas are very ancient people of north-east Afghanistan. They find mention in the Puranas, Mahabharata and other ancient Sanskrit and Pali|Pali literature. Sanskrit term ashva , Iranian languages|Iranian aspa and Prakrit assa means horse. The name Ashvaka or Assaka is said to be derived from Sanskrit Ashva or Prakrit Assa and it litterally denotes someone connected with the horses---hence: a horseman, or a cavalry|cavalryman. The Ashvakas were especially engaged in the occupation of breeding, raising and training war horses, as also in providing expert cavalry services to outside nations, hence they also constituted the ayudhajivis (or shastra-opajivis) class of warriors. Panini notes the Aspas and the Ashvakas of the Kunar River|Kunar and Swat River|Swat valleys as Ashvayana and Ashvakayana respectively (Ashtadshyayi: Sutra IV-1, 110; Nadadi gana IV-1, 99). classical antiquity| Classical writers use the respective equivalents Aspasios (or Aspasii, Hippasii) and Assakenois (or Assaceni/Assacani, Asscenus/Assacanus). The Ashvakas were located in the eastern parts of modern Afghanistan in the intervening river valleys starting from Laghman in the west up to river Sindhu in the east. Their main concentrations were in Kunar River|Kunar and Swat River|Swat valleys on the north of river Kabol in Paropamisadae. Aruppa-Niddesa of Visuddhimagga by Buddhaghosa describes the Kamboja land as the base of horses (10/28). Kambojo assa.nam ayata.nam......................... || Samangalavilasini, Vol I, p 124||. 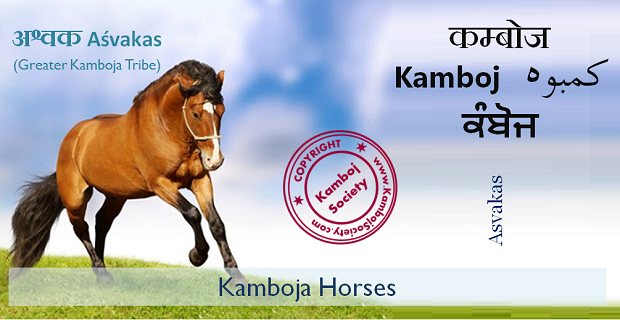 Translation: Kamboja, the land of horses (assa). Assaka = The Kambojas connected with horses; horsemen; cavalry. Assaka = The Kamboja land or Janapada. Ashvaka = The Kambojas connected with horses; horsemen; cavalry. Ashvaka = The Kamboja land or Janapada. Commenting on the above verse of Sumangalavilasini in reference to the Kambojas, foremost Indologists like Dr H. C. Raychayudhury, Dr B. N. Mukerjee write: "With the expression Assa.nam Ayata.nam---land of horses used by Pali|Pali texts in reference to the Kambojas, may be compared the names Aspasios and Assakenois given by classical antiquity| classical writers to the sturdy people living in the Alishang and Swat valleys in the days of Alexander " (Ref: Political History of Ancient India, 1996, p 133, p 216 ffn 2, p 576; Commentary Dr B. N. Mukerjee; cf: MBH VI.90.3). From the above statement, it is very obvious that term Assaka or Ashvaka stood for the Kamboja land, Kamboja people, Kamboja horsemen or the Kamboja cavalry.. In the Anushasnaparava section of Mahabharata, the Kambojas are specifically designated as ashava.yuddha.kushalah (expert cavalry). The coins of Ashsvakas refer to themselves as vatasvaka (vata.asvaka), which in Sanskrit, equals varta-ashvaka i.e Ashvakas engaged in varta profession (Journal of Royal Asiatic Society, pp 98-100: History and Culture of Indian People, the Age of Imperial Unity, Vol II, p 45, Dr A. D. Pusalkar, Dr R. C. Majumdar, Dr Munshi etc). The use of prikritic vata (Sanskrit varta) appellation by the Ashvakas in their coins reminds one of the Varta.shastr.opajivin descriptions of the Kambojas as attested by Kautiliya in his Arthashastra (Arthashastra 11.1.4). The above view is further reinforced by Brahtsamhita of Varaha Mihira which also says that the Kambojas lived by shastr and varta (Brhatsamhita, 5.35). The Asvayanas (Kambojas) have been attested to be good cattle breeders and agricuturists by classical writers. This is clear from big number of the bullocks, 230,000 according to Arrian, of a size and shape superior to what the Macedon|Macedonians had not known, which Alexander the Great|Alexander captured from them and decided to send them to Macedonia for agriculture (History of Panjab, Vol I, p 226, Dr L. M. Joshi, Dr Fauja Singh). These above staggering figures about agricultural cattles and the war horses of the Ashvakas sufficiently prove the correctness of Kautiliya's statement on the Kambojas which portrays the Kambojas as living both by warfare (shastr.opajivin) as well as by agriculture/cattle-culture (varta.opajivin). The above facts, when viewed in the light of time and space propinquity, evidently connect the Ashvakas with the varta.shastr.opajivin Kambojas of the Arthashastra (Ref: Ancient Kamboja, People and the Country, 1981, p 11, 226). Thomas Holdich|Sir Thomas H. Holdich, in the his classic book, The Gates of India, writes that the Aspasians (Aspasios) represent the modern Hindukush Kafir people|Kafirs (The Gates of India, p 102-03). But the modern Kafirs, especially the Siah-Posh Kafirs (Kamoz/Camoje, Kamtoz) etc are considered to be modern representatives of the ancient Kambojas [https://en.wikipedia.org/wiki/Kafirs_of_Hindukush#Kafirs_and_the_Kambojas], this shows that the Aspasios (Aspas), who were the western branch of the Assakenois (Ashvakas) of classical writings, represented a section of the Sanskrit Kambojas. Dr S. M. Ali has identified the ancient Kambojas of the Puranic literature with the inhabitants of the Kunar valleys (Geography of the Puranas p 143), who, as we know from classical writings, were none else than the Aspasio off-shoot of the Ashvakan Kambojas. Dr R. C. Majumdar, Romila Thappar, noted historians of India also take the Ashvakas as same people as the Kambojas and they connect them with the people of Kafirstan. Dr Buddha Parkash notes: "The Macedon|Macedonian conqueror made short shrifts of the arrangements of Darius I|Darius and over-running Achaemenian empire, dashed into Afghanistan and encountered stiff residstence of the Kamboja tribes called Aspasios and Assakenois known in the Indian texts as Ashvayana and Ashvakayana " (Panjab Past and Present, pp 9-10, Dr Buddha Parkash; See also: History of Porus, pp 12, 38). These Ashvayana and Ashvakayana clans had fought the invader to a man. When worst came to worst, even the Ashvakayana Kamboj women had taken up arms and joined their fighting husbands, thus preferring 'a glorious death to a life of dishonor' (See: Diodorus in McCrindle, p 270). According to modern view, the name Afghan derives from Sanskrit Ashvaka or Ashvakan, the Assakenoi of classical writings. Numerous scholars like Christian Lassen, Saan Martin, L. Bishop, Dr Crooks, Dr. J. C. Vidyalnar, Dr M. R. Singh, William Smith, N. L. Dey, William Crooke, Dr J. L. Kamboj, Kiprpal Singh and several others write that the word Afghan has originated from the Sanskrit word Ashvaka......the Assakenois of the classical writings. The Kambojas were basically a republic|republican people. They were constituted into military Sanghas and Corporations to manage their affairs, as Kautiliya and Mahabharata amply attest for us. They are also attested to be living as Ayuddha-jivi or Shastr-opajivis, which means that the Kamboja cavalry offered its military services to other nations as well. There are numerous references to Kambojas being requistioned as cavalry troopers in ancient wars by outside nations. A few illustrative references from ancient literature are presented below to prove this point. According to numerous Puranas, the military Corporations of the Shakas, Yavanas, Kambojas, Pahlavas and Paradas, known as five hordes (panca-ganah), had militarily supported the Haihaya and Talajunga Kshatriyas in depriving Ikshvaku king Bahu (the 7th king in descent from Harishchandra), of his Ayodhya monarchy|kingdom. A generation later, Bahu's son, Sagara recaptured Ayodhya after totally destroying the Haihaya and Talajangha Kshatriyas in the battle. Story goes that king Sagara had punished these foreign hordes by changing their hair-styles and turning them into degraded Kshatriyas (Harivamsa 14.1-19). Bhagavata Purana refers to a war between Jarasandha and Yadavas led by Krishna|Sri Krshna. The Kambojas came as military allies of Jarasandha, king of Magadha. There is reference to the siege of Gomant Parvata where the Kamboja army was positioned on its east flank (Bhagvata Purana, 10.52.22). Bhagavata Purana (2.7.35) speaks of the Kamboja General as a powerfully armed mighty warrior (samiti-salina atta-capah Kamboja). General Sudakshina of the Kambojas was invited by Duryodhana, the Kuru king of Hastinapura to help him in the Mahabharata war against the Pandavas. Sudakshina Kamboj came to his side with one Akshauhini powerful army of ferocious Central Asian warriors which also included the Shakas and Yavanas, besides the Kambojas (MBH 5/19/21-23). Of the ten distinguished Generals appointed by Duryodhana to efficiently manage his vast host of army, Sudakshina Kamboja was one such distinguished General (MBH 5/155/30-33). Bala Kanda of Valmiki Ramayana refers to a battle between sage Vasishtha and king Vishwamitra of Kanauj. Wise Old Man|Sage Visishtha had sought the military assistance of the Kambojas, Shakas, Yavanas, Pahlavas, Kiratas and other Mlechchas from the north-west. King Vishwamitra had lost all his sons in the battle. In remorse, he renounced the world and turned into an ascetic after the war (Ramayana, 1.54, 1.55). Herodotus attests that the Gandarian mercenaries (Gandharans/Kambojans) from the twentieth strapy of the Achaemenids were recruited in the army of emperor Xerxes I (486-465 BCE) which he led against the Hellas (Herodotus, IV.65-66). Similarly, the men of the Mountain Land (Akaufaka), from north of Kabol equivalent to medieval Kohistan, figure in the army of Darius III against Alexander the Great|Alexander at Arbela with a cavalry and fifteen elephants (Dr A. M. Olmstead, History of Persian Empire, p 232; Arrian's Anabasis III, 8.3-6; Political History of Ancient India, 1996, p 216, Dr Raychaudhury). These mercenaries were the well known parvatiya Ayuddhajivins of Panini's Ashtadhyayi (IV.3.91) located on either side of the Hindukush and who belonged to Kamboja/Gandhara group (India as Known to Panini, pp 49, 437, Dr V. S. Aggarwala) . The Buddhist drama Mudra-rakashas by Visakha Dutta and the Jaina work Parisishtaparvan refer to Chandragupta's alliance with Himalayan king Parvataka. The Himalayan alliance gave Chandragupta a formidable composite army made up of the Shakas, Yavanas, Kambojas, Kiratas, Parasikas and Bahlikas as attested by Mudra-Rakashas (Mudra-Rakshasa 2). With the help of these frontier martial tribes from Central Asia, Chandragupta was able to defeat the Hellenistic Greece|Greek successors of Alexander the Great and the Nanda/Nandin rulers of Magadha so as to found the powerful Maurya empire in northern India. The Kalika Purana, one of the eighteen Upa-Puranas of the Hindus, refers to a war between Brahmanical king Kalika (supposed to be Pusyamitra Sunga) and Buddhist king Kali (supposed to be Maurya king Brihadratha (187-180 BCE)) and notes the Shakas, Kambojas, Khasas etc as a powerful military allies of king Kali. The Purana further notes these Barbarians as taking orders from their women (Kalika Purana, III (6), 22-40), which culture was typical of tribes located on Oxus/north-west. Patanjali around 150 BCE and Yuga Purana chapter of Gargi-Samhita refer to second century BCE Yavana attack on Saketa, Panchala, Mathura and Pataliputra located in Majjhima-desa or Mid India. Anushasnaparava of Mahabharata attests that Mathura country in Mid India was under the joint control of the Yavanas and the Kambojas (12.101.05). The Kamboja royal family at Mathura is also attested from Mathura Lion Capitol inscriptions of Saka Strap (Kshatrapa) Rajuvula. Vanaparava of Mahabharata woefully deplores that the sacred earth (Indo-Aryan land), in Kaliyuga, would be ruled un-rightously by Mlechchha kings of the Yavanas, Kambojas, Sakas etc (3.188.34-36). These references show that the Kamboja cavalry from north-west in conjunction with the Yavanas had invaded Mid India and ruled over it prior to Christian era [https://en.wikipedia.org/wiki/Migration_of_Kambojas#The_Kambojas_in_Mathura] [https://en.wikipedia.org/wiki/Yona#Invasion_of_India]. The evidence suggests that the second century BCE Saka invasion of western India was probably carried out jointly by the Sakas, Pahlavas, Kambojas, Paradas, Rishikas and other allied tribes from the north-west. As a result sections of Kambojas, Pahlavas, Rishikas etc had also settled into south-west and southern India as is attested by numerous Sanskrit literature of the post-Christian period. The Palas employed mercenary forces and certainly recruited horses from Kambojas as is clear from their own Inscriptions (See: Mungher Inscriptions B.8, V.13; See also: Epigraphia Indica, Vol XVIII, 1926-27, p 305; Ancient Kamboja, People and the Country, 1981, p 9-10, Dr J. L. Kamboj). According to Dr N. G. Majumdar, if horses could be brought from Kamboja, it is also perfectly reasonable to suppose that for trade and other purposes, some adventurers (from Kamboja) could also have found their way into that province (Epigraphia Indica, XXII.153). Scholars like Dr R. C. Majumdar observe that the armed forces of Pala Dynasty of Bengal had included foreigners like the Khasas, Hunas, Kambojas, Kulitas, Karnatas, Latas and Malavas etc. Writes Dr R. C. Majumdar: "Mercenary soldiers (Specially cavalary) might have been recruited from the Kambojas and some of them might have been influential chiefs". According him and some other scholars, some courageous military General of the Kambojas had later captured north-western parts of Bengal from the Palas and founded the Kamboja dynasty in Bengal (History of Ancient Bengal, 1971, p 127, Dr R. C. Majumdar; The Dacca University Studies, Vol I, No 2, April 1936, p 132; Also: Indian Historical Quarterly, XV-4, Dec. 1939, p 511, Dr H. C. Ray; The Kambojas Through the Ages, 2005, pp 216, 228, S Kirpal Singh; Ancient Kamboja, People and the Country, 1981, pp 330-332). Scholars also state that the Kamboja cavalry had also formed part of the Gurjara-Pratihara armed forces in 8th/10th centuries AD. They had come to Bengal with the Pratiharas when the latter conquered part of the province (Dr H. C. Ray, Dr R. C. Majumdar). In fact, there is stated to have been a separate regiment of the Kambojas in the army of the Pratiharas which was given the responsibility to defend the northern-eastern parts of their empire adjoining with the Palas of Bengal. When the fortunes of the Palas sagged low after the death of Narayanapala in early tenth century, these Kambojas of Pratihara had seized Gauda from Rajyapala and laid the foundation of the Kamboja empire in north-west Bengal (Indian Historical Quarterly, XV-4, Dec, 1939, p 511 Dr H. C. Ray; The Dynastic History of the Northern India, p 311, fn.1, Dr H. C. Raychaudhury; History of Ancient Bengal, 1971, pp 182-83, Dr R. C. Majumdar; The Kambojas Through the Ages, 2005, pp 216, 228, S Kirpal Singh; Ancient Kamboja, People and the Country, 1981, pp 330-332, Dr Kamboj). History of Panjab, Vol I, Dr Fauja Singh, Dr L. M. Joshi. The Kambojas Through the Ages, 2005, Kirpal Singh.